Are your landlord clients up-to-date with the latest on tax? Andrew Montlake offers his top tips to help you deliver the exceptional. Watch the video now. 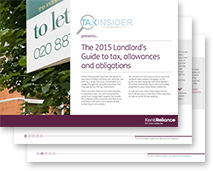 Aug 24 2015 - Are your landlord clients up-to-date with the latest on tax? At Kent Reliance we know how daunting it can be for your clients to get to grips with the tax implications of being a landlord. That’s why we’ve teamed up with independent experts to help. We have commissioned leading tax experts, Tax Insider, to write this informative guide. It has been designed for you to share with any of your clients who are currently or soon to be landlords. Want specialist mortgage solutions built on strong foundations? krbs, Kent Reliance Banking Services and Kent Reliance are trading names of OneSavings Bank plc OneSavings Bank plc is authorised by the Prudential Regulation Authority and regulated by the Financial Conduct Authority and the Prudential Regulation Authority (registered number 530504). Registered in England and Wales (company number 7312896).